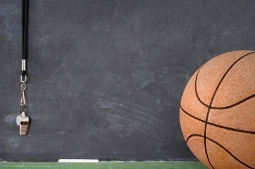 Last week, I sent out a request for my newsletter subscribers to send in their best [tag]basketball coaching tips[/tag]. Check out this one below. One of the [tag]basketball drills[/tag] that I do to change things up during a practice is scrimmaging full court and half court (with pressure and without) and allowing only bounce passes when passing the ball to a teammate (note dribbling is still allowed) but limited to 4 dribbles. I use this also on fast break [tag]basketball[/tag] drills occasionally as well. I do this [tag]basketball drill[/tag] for several reasons. 1. If I am pressing a team – I am trying to get them to throw a lob pass or a bounce pass which normally takes more time to get to the receiver; and are easier to steal. Because of this, I want my players to understand that when they are pressed they must execute solid bounce passes if they choose to use them. 2. It teaches players that they have to work harder to create spacing from, or establish position on a defensive player to receive a pass on the perimeter. 3. It teaches the players to come back to the ball to assist the passer. 5. It improves focus and discipline of the players because for most of them bounce passes are not used as frequently. If they forget and throw a chest pass during the drill…then I call a turnover. We also use no-bounce balls and heavy balls for drills.